This, was rather an easy make, and I am VERY impressed with how it turned out. 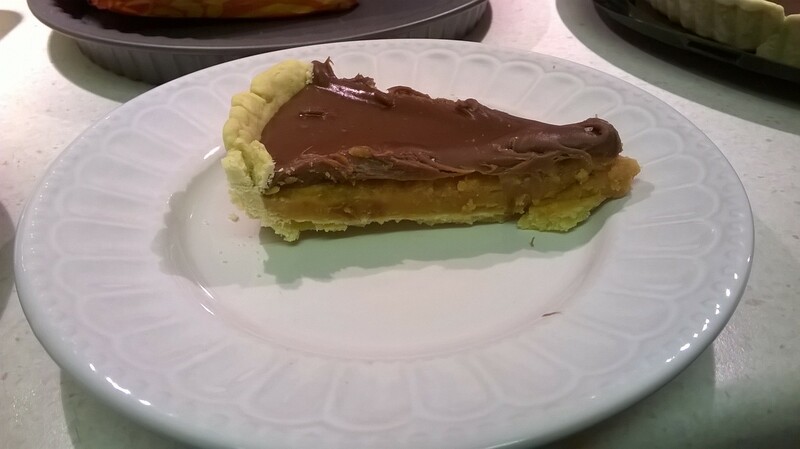 For one full tart, it cost me about £3 to make… I suppose you can say that this was a frugal make, because the richness of the chocolate and caramel meant that you can only have a small piece! Ha ha. I had my little Gning help me make this… He broke up the chocolate for me, and because the final result had lots of chocolate, he loved eating it afterwards! Make your pastry by sifting the flour in to a large bowl. Add the butter, and rub in with your fingertips, until it resembles fine breadcrumbs. Stir in the salt, then add a little water at a time to mix in to a firm dough. Knead the dough slightly, on a floured board, wrap in cling film, and place in the fridge for half an hour or so. Roll out the dough to a size to fit your tart tin, and about a pound coin thickness. Place in your greased tin, with a slight overhang on the sides… Don’t bother to trim, as the pastry will shrink a little when in the oven. Lightly prick all over the bottom of the dough with a fork, and line with baking / greaseproof paper. Add baking beans, and “blind bake” on 170C (fan assisted) for 20 minutes. After this time, remove from the oven, remove the beans and paper, then return to the oven for a further 10 minutes, or until the pastry is a golden colour. Wait until the pastry has completely cooled before turning it out on to a serving plate. Place this out the way… You won’t need it for a little while now. To make the caramel, add the caster sugar and water to a heavy-bottomed pan, and slowly bring to the boil – WITHOUT STIRRING. When the sugar water has started to boil, turn the temperature down a little, and “swirl” the pan around – still without stirring. Now it is time for a fair amount of patience… You have to wait for the sugar water to turn in to a caramel colour… This can take 10-15 minutes. Do not stir! When the sugar water has turned in to a lovely golden colour, remove from the heat, and stir in the cream. Return to the heat for a further 2 minutes, constantly stirring. Be careful at this point, as the mixture will bubble up and may “spit” when you add the cream. Remove from the heat again, and stir in the butter until fully melted. Allow to cool slightly (about 5 minutes), before pouring in to the pastry that you made earlier. 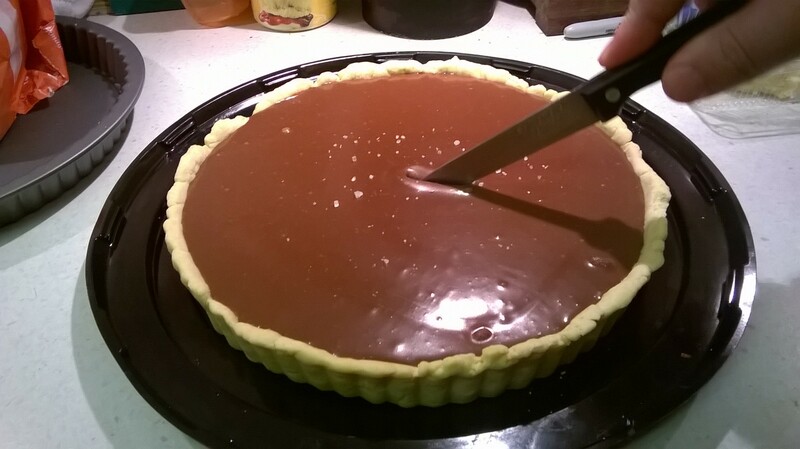 Place the caramel tart in the fridge for about 3-5 hours, or so, until the caramel has ‘set’. When your caramel has set, it’s time to make the chocolate! Break the chocolate up in to a bowl, and leave to one side. Place the cream in a heavy-bottomed pan, and slowly bring to the boil. Allow to simmer gently for about 2 minutes or so… You don’t really want to ‘cook’ the cream, so don’t have a high temperature. 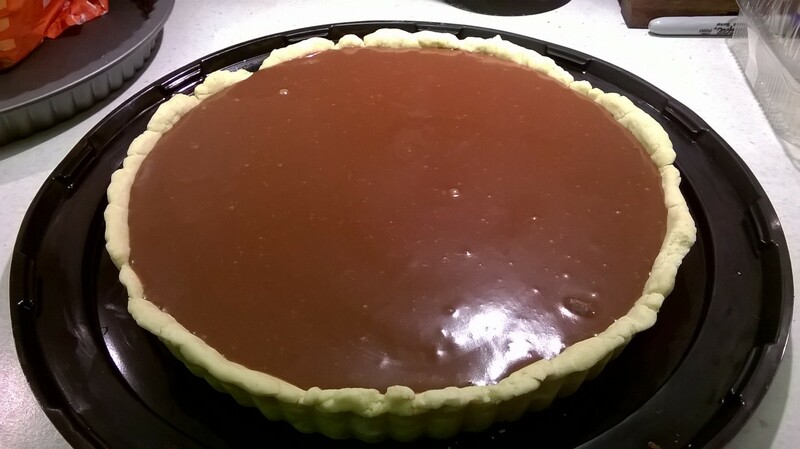 Allow to settle slightly, then pour over the top of the caramel tart. You may need to scrape, and smooth out the chocolate. Return to the fridge for a further 1-2 hours, or until set. Please be aware that the chocolate will NOT fully set. 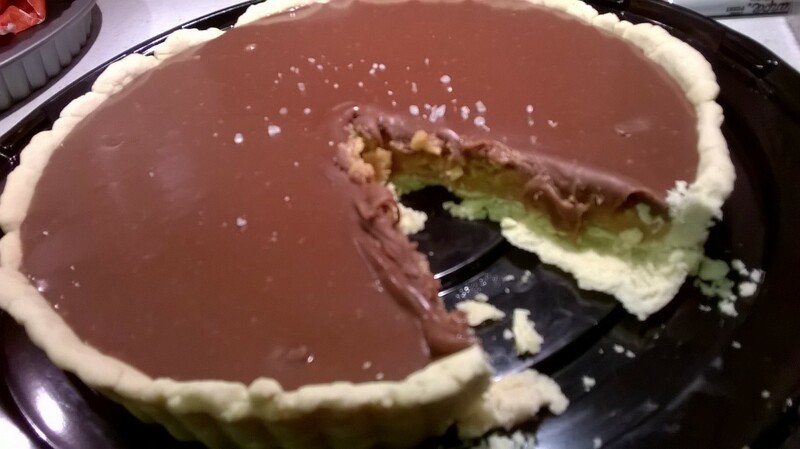 Before serving, sprinkle a small amount of coarse sea salt on the top of the tart, and serve any which way you like. Good enough to eat on its’ own, or with a strawberry and mint leaf! « 10 reasons to LOVE bananas!